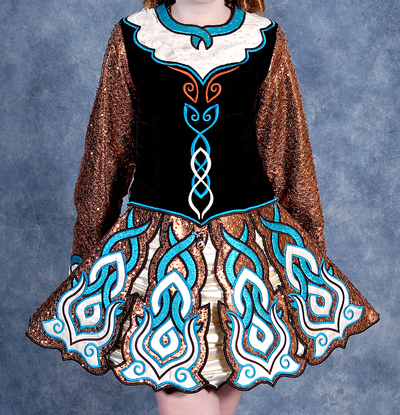 Sparkling copper with a dark chocolate bodice that looks black in photos, this dress has cream and aqua accents. Many crystal diamantes. 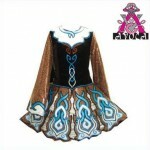 Includes lovely soft cape, two crowns, and matching kickpants. Made by Avoca (Dancing in Celtic) with superior craftsmanship, this dress has had one owner in a smoke-free home, always stored flat. It’s in great condition. Selling due to growth spurt. Can be altered — shortened, taken in, let out. Asking Price: $US550. Shipping costs are included for my own country, overseas shipping is extra. Will accept returns and refund dress cost, buyer to pay all shipping costs.